Oil Safe® Lubrication Tools | Innovative Oil Storage Systems products -- The Bernard Company, Milford CT. 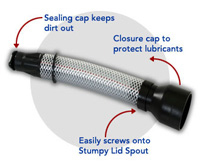 The Oil Safe Stretch Spout lid is designed for use where precise pouring of lubricants is required including hard to reach areas. Ideal for lower viscosity oils (Less than ISO 220). 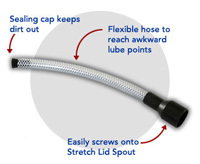 A Stretch Spout hose extension is available. This Oil Safe wide spout model is especially designed for applications where a high lubricant flow is desired. Spout has a 1" opening. Stumpy Spout Extension hose available. 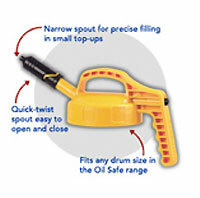 Multi purpose Oil Safe lid with large outlet hole ensures controlled fast pouring of lubricants. If you are using an Oil Safe pump, the pump screws into the top of this lid. This high volume, down-stroke discharge pump delivers 1 litre for approximately 14 strokes. Match with an Oil Safe Utility Lid and a 3 - 5 - 10 litre / US quart drum. 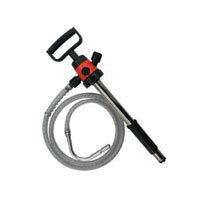 Supplied with outlet hose and anti-drip nozzle. Note: Pump cannot be used with 1.5 or 2 litre/Quart drums and is designed to be used with a Utility Lid. The Oil Safe 1.5 Litre / 1.5 US Quart Drum is ideal for small top-up work such as small reservoirs and oil filler bottles, particularly when mated with the Mini Spout Lid. Fully interchangeable with any Oil Safe lid, these drums have a extra wide neck opening for rapid pouring and easy cleaning. Comes with one contents label. Note: The 1.5 liter drum cannot be used with Oil Safe Pump. This Oil Safe 3 Litre / 3 US Quart Drum is a very practical size for servicing small to mid-range equipment filler applications. Fully interchangeable with Oil Safe lids these drums have a extra wide neck opening for rapid pouring and easy cleaning. Comes with one contents label. This Oil Safe 5 Litre / 5 US Quart Drum is an excellent all-round size for a host of standard applications from engines and pumps to turbines and gearboxes. Fully interchangeable with Oil Safe lids these drums have an extra wide neck opening for rapid pouring and easy cleaning. Comes with one contents label. This Oil Safe 10 Litre / 10 US Quart Drum is the ideal size for large sump fill applications while still maintaining mobility and ease of use without all the heavy lifting and potential back injuries from lifting larger impractical drums. Fully interchangeable with Oil Safe lids these drums have an extra wide neck opening for rapid pouring and easy cleaning. Comes with one contents label. 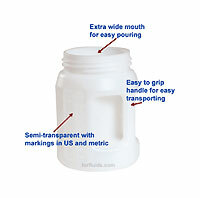 The adhesive contents labels from forfluids.com are large, easy to see labels that can be used with any of the Oil Safe products. 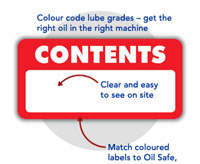 Ensure the right lubricant goes into the right machine - every time! Simply match Content Label colors with Oil Safe Dispensing & Storage Lid colors. There is plenty of space to clearly mark or write lube grades. 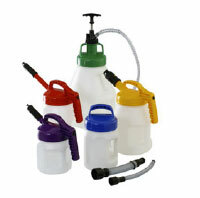 The Oil Safe Sample Kit comes with 5 lids and 5 drums in addition to an Oil Safe standard pump and lid spout extensions. Improve your lubrication instantly with the Oil Safe Sample Kit. With an outlet diameter of approximately .25" (7mm), the Oil Safe Mini Spout is ideal for lubrication jobs where equipment filler holes are small such as constant level oilers and machine tools. . These Heavy Duty lever Oil Safe grease guns are designed for use in heavy use in industrial applications. 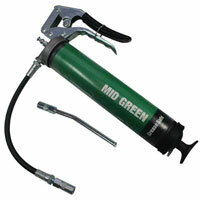 Oil Safe grease guns are available in 10 colors for quick and easy coloring. 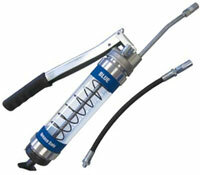 Oil Safe grease guns are provided with both a 6" steel extension and 12" flexible extension. 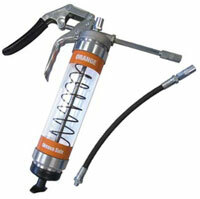 Oil Safe grease guns come with variable stroke lever action for greater control. Oil Safe Grease Gun Holder - Standard. For use with color-coded 14 oz steel body grease guns. Simple snap action clamp mounts on almost any surface.